Wow am I behind. But what a day to come back. It is my 27th birthday! Happy birthday to me! We decided to switch internet providers and had quite a gap between service. Even once we set up the new internet, I haven't been home to use it! 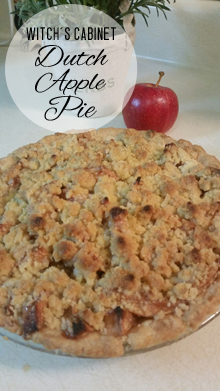 Originally I had planned on sharing this recipe around Mabon, but when I made the pie, it flopped. I used the wrong apples. So, now with Samhain around the corner, I want to share my favorite apple recipe of all time, my mother's Dutch Apple Pie. This pie is probably the most amazing pie you will EVER eat. Trust me! Unlike my mother, however, I make my own pie crust! Preheat oven to 400°. Mix together the pie filling ingredients (apples, sugar, cinnamon, and flour) in a large bowl. Set aside. In your pie pan, add the flour and salt and create a well in the center. Pour the milk and oil into the well and mix until smooth. I find using my hands the best way to mix, but a fork works too. Press the dough out to cover the bottom of the pan and pinch the edges. It should look like a normal pie crust when you have finished. Pour apple filling into the crust, making sure to get all the juice that has formed. 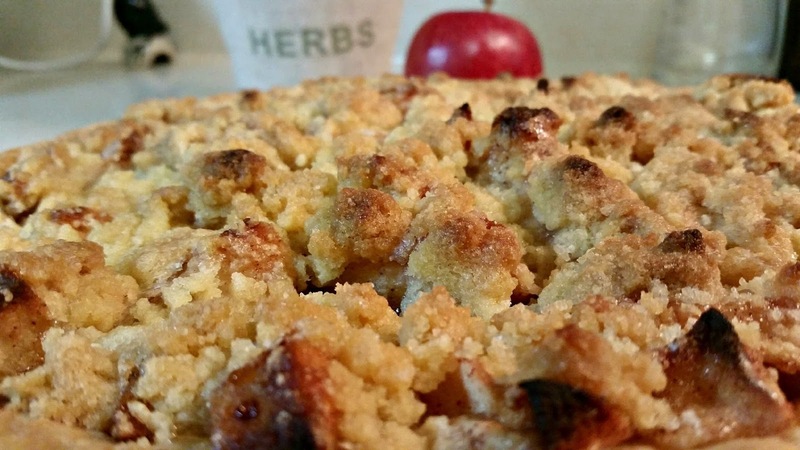 In a separate bowl, cut in the topping ingredients until a crumble forms. Sprinkle over the top of the pie filling. Bake for 45-50 minutes. If the crust begins to brown, cover with foil. The pie should be bubbling out of the crumble topping when it is finished and the crumble should be golden. If it isn't, continue baking for 5 minute intervals until done. This makes one delicious pie. Allow it to cool slightly before serving. This is great paired with vanilla or cinnamon ice cream, but wonderful all on its own. I hope you enjoy this pie as much as I do! Need directions for the crust? As you can see I drew a rune at the bottom of my crust to infuse this pie with a little bit of magic. I picked the rune Fehu to infuse the pie with abundance, wealth, and happiness, a fitting rune for this time of the year. Thank you! I'm glad you pinned the recipe and I hope it turns out well.